If the human body was devoid of all calcium, it would take on the form of a shapless mass of skin. The reason being is that the majority of the bodies calcium is found in the skeleton and the teeth. Only 1% of calcium mineral is found in the soft tissues and the blood stream. 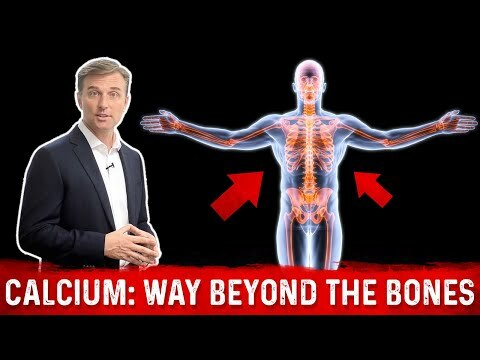 Calcium being the most prominent mineral in the body, it will come as no suprise that practically every food that we consume contains some amount of calcium. In addition to its crucial role in helping the body develop and maintain strong bones and teeth, the calcium mineral plays a role in several other very important body functions. For instance, calcium helps regulate the rhythm of your heart beat. It helps ensure that nutrients are passed into and out of cell walls properly. Calcium helps nerves and muscles function correctly. It plays a role in lowering cholesterol levels and blood pressure. The blood clotting process could not work correctly without calcium. And if you've ever been told to drink a glass of milk before bed, there's a reason for this advice. Calcium helps relieve insomnia. Getting adequate amounts of calcium is easy. The most concentrated and well absorbed calcium sources of are found in dairy products such as milk, cheese (cottage and cheddar) and yogurt. Tofu (as long as it is firm and processed with calcium sulfate), dried beans and dark green vegetables such as broccoli, kale and bok choy also are good sources of calcium. You will also find calcium in foods that have been fortified with it such as orange juice and some cereal products. Eating drained sardines (and their bones) that have been packed in oil is another option. The required daily allowances for calcium vary depending on age. Infants and toddlers should get 400 and 600 mg respectively. Children should increase their intake of calcium to 800 and increase to 1200 mg/day as they near puberty. Teenagers need a lot of calcium because a significant amount of bone mass is being added during this stage of life. Adolescents and even young adults should strive to get 1200 mg/day. Pregnant women should try to get between 1200 and 1500 mg/day of calcium. Men need 1000 mg/day but those age 65 and above need to increase their daily intake of calcium to 1500 mg/day. When the body does not get a sufficient intake of calcium, the bones suffer most. The first noticeable sign of calcium deficiency is bones that become soft and brittle. With a continued calcium deficiency, osteoporosis, a condition in which the bones begin to deteriorate, often develops, especially in women during and after menopause. Children who do not consume sufficient quantities of calcium generally will experience growth-related problems including bone deformation. Children also can develop Rickets, a condition that had at one time virtually been eliminated. Decaying teeth, depression and spasms in the legs and arms are other noticeable symptoms of a calcium deficiency. Drinking milk is definitely one habit that's worth starting and worth continuing throughout life. Doing so helps the skeletal system develop fully and helps keep teeth and bones strong.